In 1995 the club dues were raised to $18.00 to help pay for newsletter, rent, show and program. The clubs first picnic was at Alden Park in September. A few club members contacted other carving clubs to get information about rules and categories and classes. Ray Olson put carving club information together and a carving show was established. The first club show was in 1995 at VFW in Loves Park, IL. Don Clark was the first chairperson of the carving show. Ray Olson wrote the first show result sent to Chip Chats Magazine. A carving class of a Woodlily/Hummingbird was the project with Ray Olson teaching. 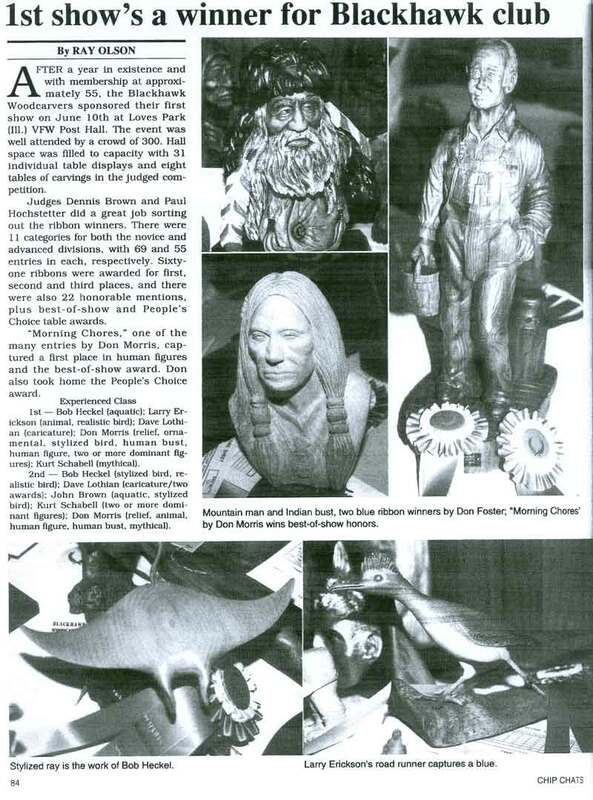 April 1995 was the first edition of the newsletter sent out by the carving club. No record of who edited the newsletter. Gordy Moscinski taught a flute carving class. December meeting is Christmas Party. Refreshments and tools swap and etc. Once again, a special thanks to Philip Timm for the great demonstration on how to carve faces on fence posts. It's amazing how much talent we have in our club and Philip is a good example of that. THANKS AGAIN, PHILIP! Just a reminder!! Anyone who checked out videos, PLEASE bring them to our next meeting. Thank you. Eric Heng has moved to St. Louis this past weekend. We wish him all the best. GOOD LUCK, ERIC!! Our meeting scheduled for Tuesday, February 21 will feature Ralph Cunningham of Winnebago. From what Lloyd and Rick have said, he's an excellent carver. Ralph does carve birds and fish, so I 'm sure it will be an interesting program. Last month our time ran out and we were not able to elect our officers for this year. Well. let's try again! Last month, Del Lohr of Cedar Ridge Hardwoods gave a great explanation of the different kinds of woods and did it in easy to understand language. If you have checked out a video PLEASE bring them to the meeting! June 10th Carving Show is coming up quick. It would be nice if every member entered at least 2 or more projects. Let's all get involved!! We have committed to the Beattie Park Art Fair again. So this year let's all get carving items for that fair. We did great last year for the short time we had to get prepared. This year we have the time. We just need everyone's help!! Entry forms and rules for our June lOth Carving Show are now available from Ray Olsen. We encourage all our members to enter. Ray also need volunteers to work that Saturday. Call Ray at 399-3672. Madison Wisconsin Carving Show will be held April 30TH 10:00 AM to 4:00 PM at the Quality Inn in South Madison. This year the Club will give out a "Carver of the Year" award. It will be given by points awarded to those who participate in our Show & Tell at the monthly meetings. All Show & Tell items will be put on display at our 3rd Tuesday meeting and voted on by the members. 25 points by just participating, 50 points for 3rd, 75 points for 2nd and 100 points for 1st. So, make sure to bring your Show & Tell items. Ray Olsen gave a demonstration on carving a Wood Lily & Hummingbird at our last meeting. "GREAT JOB!" PLEASE REMEMBER TO BRING IN VIDEO TAPES! We are hoping all members who have not paid their dues for 1995 will take care of this A.S.A.P. Please contact Phil Timm 965-8825. Our application for the Beattie Park Art Fair was returned to us with the explanation that they didn't want us or any other clubs. Whatever!! Remember ... our show is Saturday, the 10th of June. If you have not entered as yet, please do so. The table space is limited and about 50% is already reserved. You can still enter the show without a table. Just call Ray Olson at 399-3672. Delmar Lohr (239-1896) called and says he has a good stock of cedar. If anyone is interested, just call him. Capital carvers have notified us about the carving classes to be held this year. They will be one day affairs beginning Friday, August 25 and Saturday, August 26th. Subjects to be carved have not been decided yet. If you are interested, contact Cliff Drinkwine, 510 Dorn Drive, Waunakee, WI 53597-1522. Classes will be held at the Quality Inn in Madison again. Plans are being made to sponsor a one day carving class in September or October. The instructor is to be Don Morris. The class will be held on Saturday (8:00 am to 5:00 pm) at KenRock. The exact date is to be scheduled in July. The cost will be $50 including cut-out. The carving has been tentatively decided as being a Santa Face/Wall Mask. Let Ray Olson know if you are interested. The class size will be limited to 12 people. Please call A. S. A. P .
Our Club patches are here. Please pick yours up from Phil Timm. The cost is $3.00 each. Thanks to all who worked on, displayed and entered the Carving Show. There were 29 entrants judged, 69 novice pieces and 55 open pieces. The attendance was approximately 300. Our most winning entrant was Don Morris. He won Best of Show and Peoples Choice. We had 31 display tables. We did have some problems and are looking for your input. What didn't work well for you? What can we correct for next year? Feel free to give your comments to Ray Olson. Be sure to bring a carving to the program nights every 3rd Tuesday. Then YOU can be part of the Carver of the Year Award. July 18, 1995 -- The program will feature Bill Thumm. Bill is one of the better bi rd carvers in the area. He has agreed to share his skills with us. Don Morris will teach "carving of Santa Face/Wall mask" on October 21st. Class time is 8:30AM to 5:00PM. Place Kenrock Community Center, cost $50.00, $10.00 extra if you want a study cast. Class limited to 12 people. Contact Ray Olson 399-3672 to get signed up. At our carving night starting on the 5th of September, Group help for this carving project will be given by Ray Olson. We will carve, assemble and paint on carving nights until project is done. Cut outs are $2.00 contact Ray (399-3612) if you are interested. Picnic date is September 10th, Place is Alden Park Shelter on Alpine in Rockford (Near Rural St.). Time 12:30 to 5:00Pm. Bring dish to pass, your own Drink, Meat and any items you want and your table service. Bring your carving tools and lets carve, and do not forget the family. Be sure to bring a carving to show at the monthly program meeting on the 3rd Tuesday of the month, this part of the carver of the year award and we want you all to participate. Those who have been coming to the meeting have seen some very nice carvings so do not miss these meetings. The Don Morris carving class on the 21st of October is all set, location is at Kenrock 8:30AM to 5:00PM. If you have signed up and have not paid the $50 fee please remit to Ray Olson. All checks to be made out to Don Morris. Tools needed for class are mainly gouges. Show date is June the 9th, 96. Show location will again be at the Loves Park VFW Post same place as last years. Don Clark is the chairman for the show this year and will need your help, as he forms his committees, do not be afraid to sign up. Now is the time to start those carvings you are going to enter in the judged part of the show. We will also have a raffle as a fund raiser for the club, do your part by having at least one carving to donate to this raffle. Don Clark can be contacted by phone at 815-229-5042 for further Information. Election of officers for the 1996 year will take place in December. We are presently putting together a slate of candidates, if you are interested the club needs your participation for this one year rewarding experience. Contact Ray Olson at 399-3672. We are always in need of people to share there talents by putting on a demonstration at our third Tuesday meetings. You do not need to be an expert to do this. If you feel you can not do a program do you know some one who may be willing? If you have some subject pertaining to carving let us know and we will try to find someone to do it. Call Ray Olson with input 399-3672. Attendance at the picnic could have been better. Those who did get there had plenty of good food and we did get in a little carving. We did have some unwelcome guest’s called bees, we didn't enjoy them but they seem to enjoy our food, hope we can have a better showing next year. We will be working on finishing the carving of the Woodlilly/Hummingbird for the next meeting. The next group project will be carving an Indian flute. For this project contact Gordy Moscinski 874-7978 for further details.